I recently got a new car and still have the free trial of satellite radio. During my commute, I like to flip between channels 7, 8 and 9: the seventies, eighties and nineties channels. I love how I can go from American Pie to Gin and Juice in one car ride. One of my new goals with this blog is to start recording some of my childhood memories. And music brings back such powerful memories. The last two nights, on my commute home, I've heard Billy Joel songs. I was never a huge fan of Billy Joel growing up, but his music was really popular in the early 80s. I'd never decide to listen to his music now, but the 80s channel played two songs I couldn't switch off. 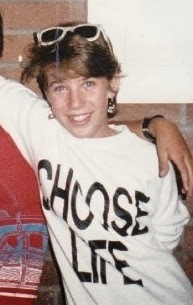 Me, circa a really long time ago. The first was Uptown Girl. Back in the ancient days of my youth, I attended a summer camp for young teens. Every day we went on a different field trip, from the movies to the beach. And every other week, we went on a camping trip. It was perfect. I made some great friends there, had some of my first crushes, and met the first guy I would "go with." Anyway, on one of these camping trips, we had a talent show, and this boy did a lip sync performance to Uptown Girl. I was the girl, and sat in the camp's big bus, wearing cool Ray Bans or knock-off Vuarnets or something, and there was some big reveal where the bus pulled up and I was sitting at the open window. I don't remember exactly. But I felt pretty damn cool. The other was The Longest Time, which has this 1950s doo-wop feel. My dad loved this song, and at the time my dad, my brother, and I were all taking music lessons. Billy played piano, I played flute, and even my dad had picked up the clarinet he played when he was younger. We all had the same music teacher, and at my dad's request, Mr. B wrote the parts for all three of us to play The Longest Time together. Honestly, I don't think we ever really nailed it as a trio. As far as I can remember, we played the thing just a couple times all together, and I'm pretty sure no one ever made a recording of it. But I remember the effort, and I would bet that hand written sheet music is still in the piano bench at my parents' house. Labels: Billy, Billy Joel, memories, not about autism! Send her to our local public school, which we're not thrilled with. Send her to the public charter school, which we're going to see tomorrow, but will likely have it's own issues. Send her to private school. But it's even more complicated than that. We also trying to move, and we have to figure out Moe's school. We'd love to move into a better district for both kids. But a better district means more expensive houses, and a very competitive housing market. We might find a house we like in a district we like but still get outbid. Most houses here get many offers, go well over asking price, and are usually all cash, no contingency offers. We did find a private school that we really like for Jelly. But they have very few open spots so there is a possibility she will not get in. (Though who wouldn't want her? Seriously.) And it is a bit farther than we'd like, although it is on my way to work. If she gets in, we could move closer. But if we moved closer, we'd also be in a better school district, which means we just dropped a lot of money on a new house and we might not need private school. Or we still might not like the public school, which would be a very expensive and disruptive option. We could stay in our current house, which has the distinct advantage of being the house we live in right now. The house is small and we really could use more space. But it is a nice house and basically Moe-proofed. If we stay, the schools aren't great for either kid. We know the program isn't appropriate for Moe, but if we do decide to fight for a non-public placement, at least it is the devil we know. If we move, we will be starting over, for better or worse. The programs could be better for him, but we really only know their reputations. You don't really know until you get there. I'm also commuting and our goal has been all along to move farther north, which would make my commute shorter, and Jeff's longer—but he'd be going against traffic. But then, we're back in the better schools means more expensive houses, means... You get the idea. As I said: it's complicated. Moe does not currently attend school. He is homeschooled, and we have crafted a program that we think best meets his needs right now. As I have written about before, our district program is not appropriate for him. They do not agree. If we want him back in school, we either have to move; send him back to his old school, allowing him fail so miserably it is obvious he needs a non-public placement (which we are not willing to do); or sue the school and hope we win. We're trying for the first option but the Bay Area home market is nothing short of ridiculous now. Now we have another challenge. Jelly starts kindergarten in the fall. Our district has some great schools but our home school, which is just at the end of our block, has a mediocre reputation. Still, we hoped that would be a good option for Jelly. Friday, Jeff and I went on a kindergarten tour. And we quickly realized that this is not the school for her. There are several reasons, but it is enough to say she won't be going to our home school. Like with Moe, we also have three choices: we can move (see above fact about ridiculousness of Bay Area home prices); try to get into the district's charter school, which we'll be visiting on their tour date later this month; or send her to private school. And while the cost of private schools around here is roughly equivalent to buying a new car every year, it is probably still less insane than the housing prices. So we've been touring private schools. Some of these schools are remarkably beautiful. Some have chefs, as you'd expect for the children of Google and Facebook employees. Others have wonderful philosophies but are tiny, without a decent social atmosphere. And others are, well, specific. There are several bilingual immersion schools, Waldorf and Montessori schools, several religious schools, and even one based on mindfulness. But what strikes me most is that we have a choice. With Moe, all our choices have, in effect, been taken away from us. And while we want to make the right decision for Jelly—we take it very seriously, in fact—we do know that she will be probably do well anywhere. And if we choose a school, and it isn't right for her, we'll change. There are options. Why is it that the kids who have the greatest need, for whom the stakes are so much higher, have so few options? That the kids who truly need a specialized, individualized education, receive little more than lip service to that effect? When it comes to Jelly's education, we get to find what is best, while with Moe it is only what is appropriate? Ponder that for a while. I'll be filling out kindergarten applications. Happiness seems to be a popular topic these days, inspiring research, TED talks, and lots and lots of books. I've recently read a few of these, including most of The Happiness Hypothesis, which I was enjoying but took a break from because I left my Kindle in Big Sur (Big Sur+good book+great friends=Happy, by the way). And most recently, I read Happier at Home by Gretchen Rubin, as a part of From Left to Write. I have always been a fairly optimistic, happy person. Even after my brother passed away, though I was devastated, I still considered myself a generally happy person. Many great things have happened since then and I wasn't going to let the rest of my life slip away. But having a child with special needs has put a damper on my happiness. This is not Moe's fault. Nor is it just my fate to be unhappy. The premise of most happiness research is that happiness is within our own control; external circumstances have a fairly small impact on any person's long term happiness. But I admit, I've struggled with finding that place of optimism. What I find so difficult about raising a child with autism, is the lack of control I have over how my day will go or what my life looks like. My house, which should be a place of refuge, is a source of almost constant stress. I cannot, for example, as Ms. Rubin does for herself, create "shrines" to things I loves or that make me happy. My collection of miniature chairs, for example, remains packed away, for surely Moe would love them to pieces. Literally. I very much enjoy decorating, and interior design is a growing hobby of mine. But my own home is not the way I'd like it to be. I had to remove curtains because Moe pulled them down. China is hidden in a locked closet rather than a buffet to protect the pieces we still have left. I do what I can to create an environment that is both functional for us and pleasing to be in, but it isn't ideal. Every aspect of our lives has changed. We don't travel. We rarely go out with friends. And until recently when I returned to work after six years of being a stay at home mom, I had lost that really big part of myself too. It is not that these things are required to be happy. Autism has made it tough to do many things that formerly made me happy—but these things should not be necessary. Happiness comes from within; I know that. And yet, reading a book like Happiness at Home, I realize how much easier it is to be happy when you're already pretty happy to begin with and when you have a pretty good measure of control over your life. If there's anything I've learned from Moe, however, it is that when things are tough, we just have to try a little harder. I'm working on it. 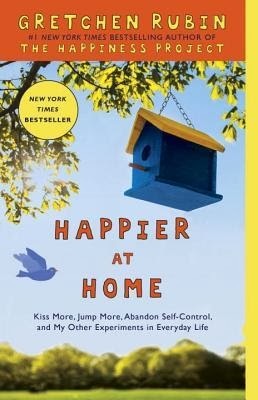 This post was inspired by Happier at Home by Gretchen Rubin where she runs a nine month experiment to create happier surroundings. Join From Left to Write on January 6 we discuss Happier at Home. You can also chat live with Gretchen Rubin on January 7 on Facebook! As a member, I received a copy of the book for review purposes. It is no surprise to my regular readers, if I still have any, that I haven't been blogging on a regular basis. I'm not going to make excuses—I just haven't made time for it. And though I know my writing seems effortless (yes, that was sarcasm), it usually takes me an hour or two, sometimes more, to write a decent post. But I don't want to abandon the blog. So I'm changing focus a little. Instead of writing longer pieces, I'm just going to share shorter thoughts or snippets from our days. I'll still be mostly focusing on Moe and our interactions, but I'm working now, so sometimes it will be about that. And of course Jeff and Jelly will make their appearances too. Jelly has been amazing lately, so funny and cute, and I don't want to forget any of it. I've also been looking for a place to write some of my own childhood memories, so maybe those will show up here as well. Moe has had a rough couple of weeks. Even though his schedule wasn't affected too much by the holidays, Jeff, Jelly and I have certainly been around more. We have a new nanny, and friends came over for New Year's eve, and all of this led to a dysregulated little boy and lots of hair pulling, scratching, and even more upsetting, some self injurious behaviors (SIBs) that we've thankfully not had too many of in the past. But yesterday Moe was jumping on his bed. I went over and took his hands and we stood about eye level with each other. I leaned in and gave him a kiss. He was so happy, he asked for another ("ma ma" which could be "more" or could be "mommy") and then actually puckered up (as best he can—it varies between duck lips and a smile) and kissed back. As you might guess, I could have done this all day, but he only did it twice, then went back to jumping. Hope you all had a great holiday season, or at least got through it the best you could Here's to finding joy in moments small and large this year.